Your Email is never revealed. yeah, pinch your self. 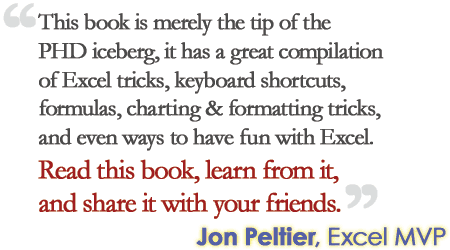 We are giving a 25 page e-book 95 Excel Tips & Tricks So that YOU can rock between 9 to 5 to all our e-mail subscribers. All you need to do is, use the above form and sign-up for our email news letter. Every weekday we will send you one e-mail with excel tips, charting tutorials, ideas that can make you productive and efficient at work. When you sign up using the above form, you will get a confirmation e-mail that includes details about how you can download the e-book. This e-book includes 95 excel tips, charting tricks and short cuts that can make you more productive and efficient in your work. Go ahead and sign up for our email news letter and download the e-book. Make sure you include the subject line as shown above, otherwise you will not recieve the ebook. Please send a link to this page: http://chandoo.org/wp/9to5/ to your friends and colleagues so that they can download the free book and rock at work.